Today more and more people are choosing to switch to small form factor (SFF) PCs. Whether you’re a gamer who needs something a little more compact to carry around, someone looking to set up a PC based home entertainment system, or just someone who needs the extra desk space, then the SFF PC could be the decision for you. Currently Shuttle is one of the leading competitors of the small form factor market with their XPC line. One of the greatest features of this rig is its innovative new internal design. A few of Shuttle’s previous XPC systems were exceptionally cramped and did not provide much of a working space at all, but their new layout has changed that quite significantly. Shuttle moved the CPU and heatsink towards the front of the chassis and moved the hard drive placement to the top of the rig, this opens up the inside quite a bit. Upon removal of the drive cage which holsters your CD/DVD ROM drive and floppy, you have easy access to the motherboard. Again, with the CPU located at the front of the motherboard, this insures it gets the most concentration of the coolest air in the case. There are also vents located in the side of the case, right next to the heatsink. 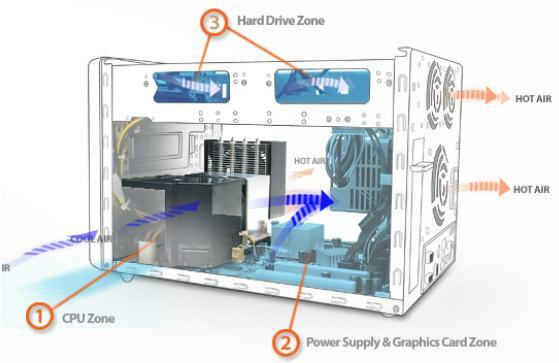 The rear of the case has two small fans on the top which cool the hard drives and a larger exhaust fan for the PSU. After reviewing this case, I only found a couple of small problems. First, when installing the hard drives, I found that the screwless drive rails leave a little something to be desired. They pop off very easily, leaving your hard drive barely hanging on for its life by a few small brackets. This is not a good thing for a SFF rig, which tends to get moved around a little more often that the average rig. Secondly, once I finally got everything installed and plugged up for the very first time, I popped in my Windows XP CD and got ready to install my RAID drivers. This is when I realized that my floppy drive was not working. I knew the drive was operable because I just pulled it out of another machine that was working, so I thought it might be the cable. This was also not the problem; the only other thing I could think of was that the floppy IDE port on the motherboard was soldered on there backwards. So I cut the key off of the IDE cable and plugged it in backwards, and sure enough, that fixed it. I researched the problem online to see if this was a reoccurring problem with this model, but I was unable to find any other cases of this happening, so maybe I just got “lucky”. Overall I believe this is an excellent case. If you are looking into upgrading any time soon, I would highly recommend giving a close look at the Shuttle XPC SB95P V2. I have one of these units and it is great value for money! Mine is running 3Ghz Dual core, Nvidia 6600 with 1.5Gb RAM with dual boot for Vista x64 and Ubuntu 'Hardy'. My only compliant is the upgrade options. With a simple option like different PSU units upto 300-400W then high spec. GPUs could be added without concern. As it is I am staying with nv6600 as that still works really well, but would like an upgrade to an Nvidia 8 Series, at least. This review looks suspiciously like the material on Shuttle's web site. Barely a paragraph of real experience with the system. Have you ever even seen this Shuttle? It's all stock images and text.